When the direction of rotation must be controlled on a DC motor the direction of current must be changed in either the rotor or the stator. If the motor is separately excited it is easy, one of the power supplies must switch leads either manually or automatically so that the current flows in the opposite direction in the one winding. Even easier is a permanent magnet DC motor, the two leads are just reversed. If the series or shunt wound motor is permanently wired internally it is not currently possible to control the direction of the motor as the current could not be changed in only one winding. Below is a diagram for motor direction control of a permanent magnet motor. For a series motor the field winding could be placed in series with the battery and the rotor winding could be placed in between the four switches in place of the motor symbol. For a shunt wound motor the field winding could be placed in parallel with the battery and the rotor winding could be placed between the four switches in place of the motor symbol. 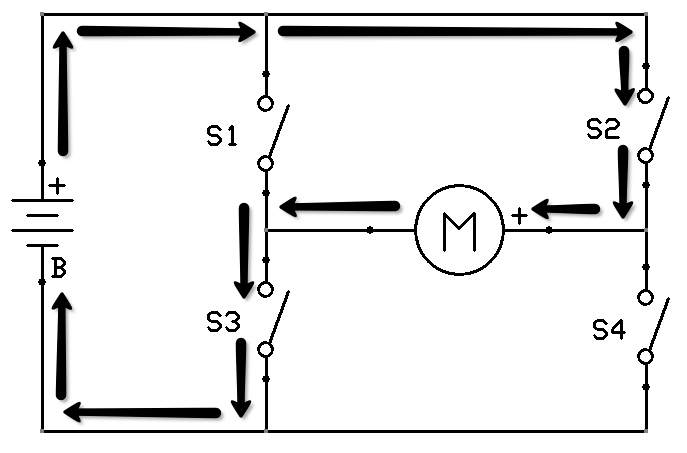 The first diagram shows the motor rotation in one direction with switches 1 and 4 on. 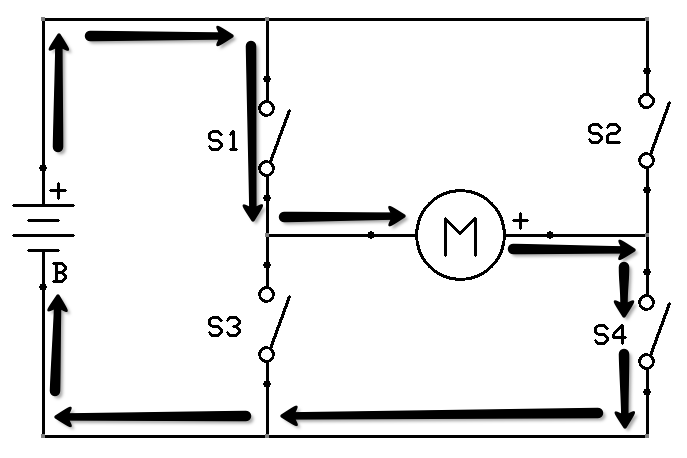 The second diagram shows the motor rotation in the opposite direction with switches 2 and 3 on. The arrows indicated the flow of current (conventional current flow). Switches 1 and 4 on, 2 and 3 off. This circuit is typically called an H-bridge because the switches and motor look like the letter H. Most often, the switches 1, 2, 3, and 4 are replaced by transistors (usually MOSFETS) or simple relays. As we will see later the transistor will allow us to control the speed of the motor as well. Therefore, if speed control is not needed along with direction control we could just use relays. In a DC motor the speed of the rotor is directly dependent on the voltage supplied to the motor. If a 24VDC motor was connected to a 24VDC source it would attain a certain speed and when connected to a 12VDC source the speed would be reduced. Given this voltage dependency, the speed of a DC motor can be controlled by measuring its speed and using the measured value against the desired value and controlling the voltage to correspond with the error or difference in the desired speed and the actual speed. 1. True or False. The direction of a series wound DC motor is controllable only if the series connection is made externally such that they could be disconnected. 2. The speed of the motor running at 10VDC is measured. The motor is then connected to a 5VDC supply and the speed is measured again. What do you expect the speed to be with respect to the speed at 10VDC? 3. An H-Bridge circuit is used to do what? 4. In order to change the direction of a series wound DC motor you would place the field winding in __________ with the battery. 5. What can be said about the current through switches 1 and 4 if both switches are on? 6. What can be said about the current through switches 2 and 3 when switches 1 and 4 are on? 7. A permanent magnet DC motor is connected to an H-bridge circuit to control the direction. The motor spins clockwise when switches 1 and 4 are on. What do you expect the motor to do if switches 2 and 3 were turned on and 1 and 4 were off?